So I've notice a few people are looking for a free memory testing program for Apple Mac, with most answers saying that the popular PC program, Memtest86+, doesn't work. Thats not true at all. It works perfectly fine, and its extremely easy. Here's how (and its also how to boot any other PC bootable CD on your Intel Mac). Memtest86+ CD, Download here http://www.memtest.org/. Hit the 'Download (Pre-built & ISOs)', unzip and burn onto a CD. Boot your system while holding down the 'alt/option' key, keep holding until you see a boot menu showing your main hard drive icon (you don't have to have the memtest CD in at this moment, but you can, its up to you). Slide in your Memtest86+ CD, and after a few seconds you will see a CD image pop up called 'Windows'. And here's what it looks like on a machine with bootcamp configured. 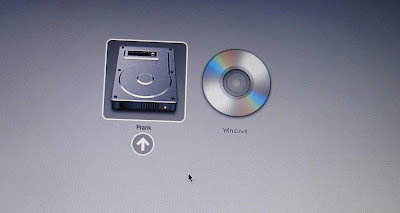 Use the arrows or the mouse to select the 'Windows' CD and hit Return, or mouse click. Done! Memtest will start running. Here's Memtest86+ Version 4.00 running on my 2007 MacBook, its on its third pass (a pass is one complete test of the entire memory). And here's a video of booting and running Memtest86+ 2.11 on a first generation MacBook Air (please excuse the lighting and audio... i filmed in a rush before work). (Notice the MacPro was the only mac that didn't diplay SPD information). Any bootable PC based disks can be booted like this, regardless of whether you have bootcamp setup or not. So if you slide in an Ubuntu Live CD in and hold down alt it show up saying 'Windows', hit return and it will boot perfectly fine. The last thing to note is pressing the Escape key like you would on a PC will not restart the system, well it didn't on the three machines i tried. Besides that, it works completely fine. Don't worry if it doesn't detect all the hardware information (like the SPD information on my MacPro), its not important. In the past I have had systems that haven't failed until the second or third pass, so for best results always run Memtest86+ 3 or 4 passes. Update: So it looks like my 2010 MacBook Pro i7 will throw errors in memtest regardless if its good ram or not, and no matter what version of memtest is being used. Apparently its a known problem, but no word if future versions of memtest will fix it. Back to the Apple hardware test disk I guess.